Bharathi attended interfaith Symposium organised by Ahmadiyaa Muslim association and presented on topic “Supreme Being in my Faith”. There were total 6 speakers representing Christian, Muslim, Buddhism, Sikhism, Judaism and Bharathi represented Hinduism . 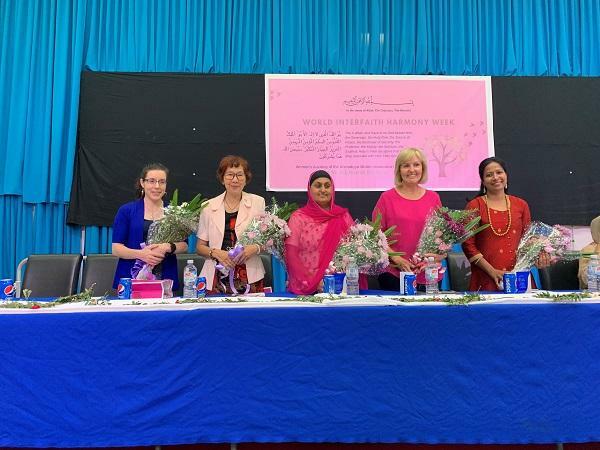 Over 120 people attended the event which was fully organised by Women for women. This is the second time Bharathi from HCA is been invited for the interfaith symposium. Who is the supreme being in Hinduism –bit challenging question ?? First of all I would like to clarify Hinduism is not mere a religion, it is rather a righteous way of life – which has spiritual path & science behind it . It has no Prophet, no single Holy Book for followers. Idols, Figurines, Saints, Scriptures etc., are all held sacred but they are not essential since it will continue to exist with the same force even if these are not there. Supreme Being is the Infinite. It must be formless since form denotes limitation. But with our finite senses it is almost impossible to grasp the idea of anything formless and limitless. So, the philosophers realised this, and said common man could do only according to the mental and intellectual equipment. It is the vessel in which he tried to contain the limitless and the formless. Like water which has no shape assumes the shape of the vessel in which it is contained for the time being, so is the concept of the Supreme Being for different persons. Supreme Being is one , appears in different forms for different person , – the way how they see. Worshipped in whatever form by people as designed in their respective scriptures, (the Supreme) assumes that form and takes the devotee on to the next higher step. One can realise Brahmam without any personal form of God. Because Sanathana Dharma is essentially the Righteous way(Dharma) of life based on the Eternal Values and Principles. Men will progress from object (persons , animals) worship through Idol(symbols) worship to the worship of the eternal, formless one – the Brahmam. These are generally referred to as Uruvam, Aruvuruvam and Aruvam. There is no concept of Heaven or Hell here. Similarly no concepts of God’s anger, punishment, Blessing, etc. The Supreme Being is Nirguna(without any attributes) .. It is all pervasive Universal Energy. It is somewhat closer to the concept of Quantum Physics in modern science. The other major concepts are law of Karma(Cause and Consequence) and the doctrine of Rebirth. Man will have to take many births till all the consequences of his Karma are extinguished. The Supreme being does not influence this in any way. Since man comes out of this Supreme Being into this world, goes through life as per his Karma and finally gets absorbed into the Supreme Being, Brahman is ever present root/real consciousness of Trimurtis and by using infinite Brahman consciousness Trimurti create, sustain and destroy the world of illusion. our famous Saint Thirumoolar , who lived in 3rd century. There is only one supreme being – which we call in different names. Yes there is only one Absolute Reality but there are many paths to attain it. The paths are various practices or methods for attaining the absolute reality. People on account of their different aptitude choose from them whatever they think best and deserved to be accepted . As all streams ultimately empty themselves into the ocean, all these paths ultimately lead to the Great Lord Himself. So, there are many paths because a single path is not suitable for everyone. And the Supreme being helps from each path. God’s Love is unconditional. The word “unconditional” means that there are no expectations or limitations set. The unique understanding in Hinduism is that God is not far away, living in a remote heaven, but is inside each and every soul, in the heart and consciousness, waiting to be discovered. And the goal of Hinduism is knowing God in this intimate and practical way.